The last 10 years Ive been carrying a SOG Xray vision as my everyday knife, and Ive always been very happy with it, but it is starting to show its age, and Ive been thinking of replacing it. Ive been considering the Benchmade griptillian which hits right around the 100 dollar price range. anyone have some other recommendations? Id like a knife that can double utilitarian and defense, and has the capability to used lefthanded as far as one hand opening and closing. In other words the thumb stud has to cover both sides, and the clip need to be relocatable. Also been looking at some Emersons, are they worth the extra hundred bucks or so? or is it paying for a name? Too many makes/models out there to choose from. Good luck with your search. Depends what model you are really interested getting. Fleebay has a few you can check. Great knives for sure. I agree...I have a few that meet your criteria, none of which cost me anywhere near a hundred bucks. I have given ladies a neck knife that while suspended around her neck the sheath is under the center point of the bra which allows easy access for the last resort defense weapon for a woman... VERY easily concealed there. Anyway, good luck on your search... there are lots out there for less than the hundred bucks...but all knife choices are personal! 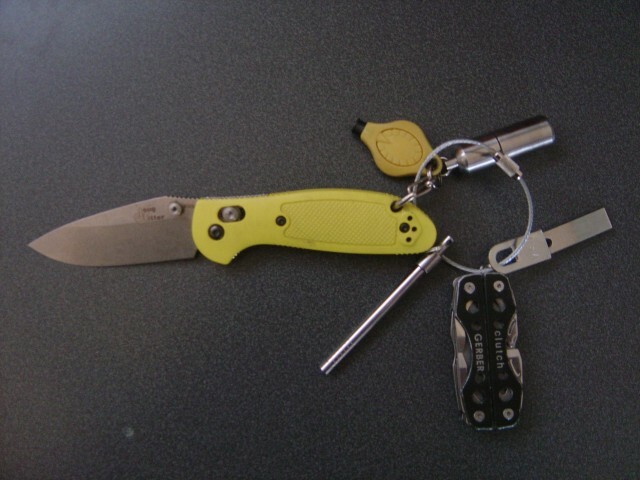 Here's an older picture from when I was a bit too much into my EDC gear... everything but the knife and the light are no longer carried in my pocket, but live in a pouch that stays in my laptop or other bags.